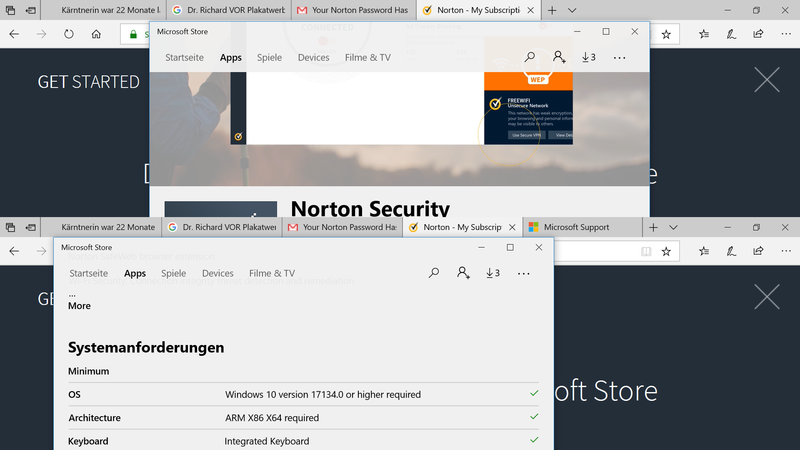 I observe my MS Windows 10 home does not rather me to install Norton Security. The Microsoft Store is telling me "Norton Security is not currently available". However, I did no efforts for to deactivate till uninstall it whether possible. I remember in earlier times Microsoft did fight for instance company Netscape, now Mozilla, in order to force the introduction of their own "Internet Explorer" web browser. Microsoft was or is seriously taking care much that only their own software house application products work more smoothly, faster, not to say fluently till "currently" on a Microsoft OS platform on everyone's desktop. Does Norton Security Deluxe has any serious advantages for the user over their own built in tool "Windows Defender"? In your blocks are many findings on how troubleshoot Windows blocking your security tool. What a review or article till (benchmark) performance comparison table would you recommend to me in order to allow to me to make myself a convincing opinion? Re: Windows 10 tends to rather not to install Norton Security. Is Microsoft objective? Just wondering are you an insider (getting the pre releases and or betas of windows 10)? No, evidently I am not an insider, unfortunately. Otherwise I would not have such questions, but know by myself which magazines I would have to read in order to draw a solution to my software product combination choice. You are perhaps not allowed to mention any publishing avoiding judging influence, because it would may appear like making advertisement for perhaps somehow sponsored articles till magazine publishers? I was asking if your in the insiders program because I know some insider beta's don't allow you to use other antivirus/security vendor's software. I would recommend that you turn off Fast Startup in Power Controls. Do you have any other live Security programs or trial security programs installed? If you do have any, then please uninstall using removal tool from the other vendor and then restart your computer. Do you know about background reasons why Microsoft Store blocks away Norton tools? Does Microsoft recognize Norton tools as security problems in their store testing phases? Does Microsoft just fall back again to do OS holding power play against other software development houses it does not directly identify as their (close) friends or business related partners, but rather competitors? Thank you for your helping effort, but I believe your answer is off topic in regard to my question. Microsoft Store is not blocking Norton Tools. Most software for Win 10 is still offered by the older, conventional distribution methods. ie Retail packages, and direct downloads from the developers. It is up to the developers if they want to try to have their products distributed through the MS Store. But with a product that can have updates required as frequently as a security software package, the time required by MS to verify every new build would be a security risk for users of the security software. I observe sort of remote control over my Windows 10 Home OS notebook I use with a current Norton Security protection, while it is in the Internet. Is it possible to verify till to track down such stealthy intruders? MS "Remote Desktop" or "Team View" certainly is not available on an OS "Home" version. The PC has not received any other installation. 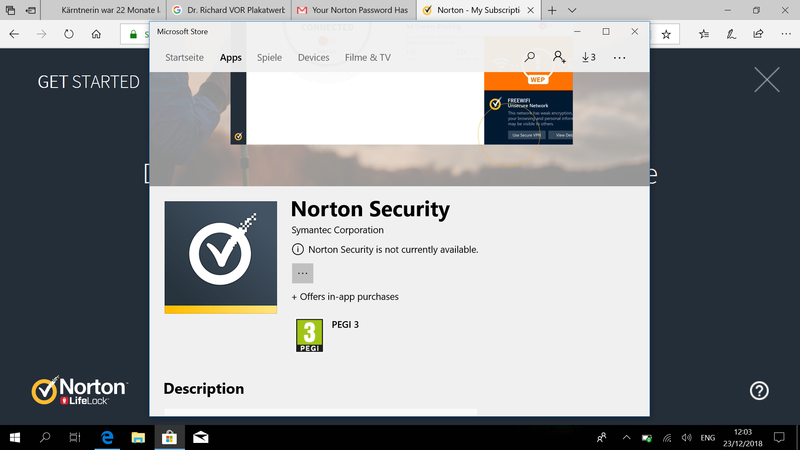 It is still such as set up as it has been sold to me, but my direct install of Norton Security which is not recommended to be installed and unavailable through the "Microsoft Store", although it is supposed to be more comprehensive than the by default pre-installed "MS Windows Defender". How can Norton Security (I abbreviate "NS" in the following) may help to detect such till now apparently unrecognized malicious software for intruders taking over control of someone's Windows 10 home although it activiely is NS protected? Those events happen in dependence on what I am actually writing as an email in a web mail portal through the browser Internet Explorer. I do not use Google Chrome, since I am aware of that it supports a sort of "MS Remote Desktop" or "MS Team View" due to built in Web browser Apps, but being about as powerful in operational possibilities as those two aforementioned are commonly known to be. Thank you very much for your solution suggestions in upfront. You will not find Norton products in the Microsoft Store. Norton products are found in the Norton Store or can be purchased in other reliable sites or stores. Please see this. How old is this computer? Have you check for dust and dirt accumulation inside the computer? This can cause overheating which could explain the symptoms you mention. Did the PC come with any other security software. Even a trial version, if not a Norton product, can conflict with Norton. You would need to fully remove that other software using the removal utility for that software before installing Norton.